Portland Head Light, is a historic lighthouse in Cape Elizabeth, Maine. The light station sits on a head of land at the entrance of the primary shipping channel into Portland Harbor, which is within Casco Bay in the Gulf of Maine. Completed in 1791, it is the oldest lighthouse in the state of Maine. The light station is automated, and the tower, beacon, and foghorn are maintained by the United States Coast Guard, while the former lighthouse keepers' house is a maritime museum within Fort Williams Park. Construction began in 1787 at the directive of George Washington, and was completed on January 10, 1791 using a fund of $1,500, established by him. Whale oil lamps were originally used for illumination. In 1855, following formation of the Lighthouse Board, a fourth-order Fresnel lens was installed; that lens was replaced by a second-order Fresnel lens, which was replaced later by an aerobeacon in 1958. That lens was updated with a DCB-224 aerobeacon in 1991. In 1787, while Maine was still part of the state of Massachusetts, George Washington engaged two masons from the town of Falmouth (modern-day Portland), Jonathan Bryant and John Nichols, and instructed them to take charge of the construction of a lighthouse on Portland Head. Washington reminded them that the early government was poor, and said that the materials used to build the lighthouse should be taken from the fields and shores, which could be handled nicely when hauled by oxen on a drag. The original plans called for the tower to be 58 feet tall. When the masons completed this task they climbed to the top of the tower and realized that it would not be visible beyond the headlands to the south, so it was raised approximately 20 feet. The tower was built of rubblestone, and Washington gave the masons four years to build it. While it was under construction in 1789, the federal government was being formed and for a while it looked as though the lighthouse would not be finished. Following passage of their ninth law, the first congress made an appropriation and authorized the Secretary of the Treasury, Alexander Hamilton, to inform the mechanics that they could go on with the completion of the tower. On August 10, 1790, the second session of congress appropriated a sum not to exceed $1500, and under the direction of the President, "to cause the said lighthouse to be finished and completed accordingly." The tower was completed during 1790 and first lit January 10, 1791. During the American Civil War, raids on shipping in and out of Portland Harbor became commonplace, and because of the necessity for ships at sea to sight Portland Head Light as soon as possible, the tower was raised twenty feet. The current keepers' house was built in 1891. When Halfway Rock Light was built, Portland Head Light was considered less important and in 1883 the tower was shortened 20 feet (6.1 m) and a weaker fourth-order Fresnel lens was added. The former height and second-order Fresnel lens was restored in 1885 following mariners' complaints. The station has changed little except for the rebuilding of the whistle house in 1975 due to it being badly damaged in a storm. Today, Portland Head Light stands 80 feet (24 m) above ground and 101 feet (31 m) above water, its white conical tower being connected with a dwelling. The 224 airport style aerobeacon is visible for 24 nautical miles (44 km; 28 mi). The 400 watt metal halide lamp is rated for 20,000 hours and produces 36,000 lumens of light at 200,000 candlepower. The grounds, and keeper's house are owned by the town of Cape Elizabeth, while the beacon, and fog signal are owned and maintained by the U.S. Coast Guard as a current aid to navigation. 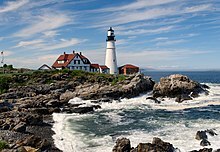 It was added to the National Register of Historic Places as Portland Head light (sic) on April 24, 1973, reference number 73000121. Edward Hopper painted the lighthouse in 1927. The watercolor resides at Boston's Museum of Fine Arts. A snowy Portland Head Light was featured in the 1999 drama Snow Falling on Cedars, which was filmed during the Ice storm of 1998. The lighthouse was featured on ABC Networks Marvel Television show Agents of S.H.I.E.L.D - Season 5 (2017/2018). It had an underground bunker used by SHIELD for an apocalyptic event and acted as their covert base of operations. ^ Light List, Volume I, Atlantic Coast, St. Croix River, Maine to Shrewsbury River, New Jersey (PDF). Light List. United States Coast Guard. 2009. p. 63. ^ Rowlett, Russ (2009-10-09). "Lighthouses of the United States: Southern Maine". The Lighthouse Directory. University of North Carolina at Chapel Hill. ^ "Lighthouse and Buildings, Portland Head, Cape Elizabeth, Maine". Museum of Fine Arts. Retrieved 9 January 2017. ^ "Movies Filmed in Greater Portland & Casco Bay Region, Maine". Maine Living. Retrieved 9 January 2017. The producers had to go to Cape Elizabeth, Maine for the perfect lighthouse. The script calls for a snowstorm, and they got one, shooting the Portland Head Light during the infamous ice storm of 1998. This page was last edited on 24 March 2019, at 13:28 (UTC).